Started in November 2015, the scheme offers new two-room flexi flats to families and singles. The default lease length is 99 years. But the flats are more popular with older buyers. 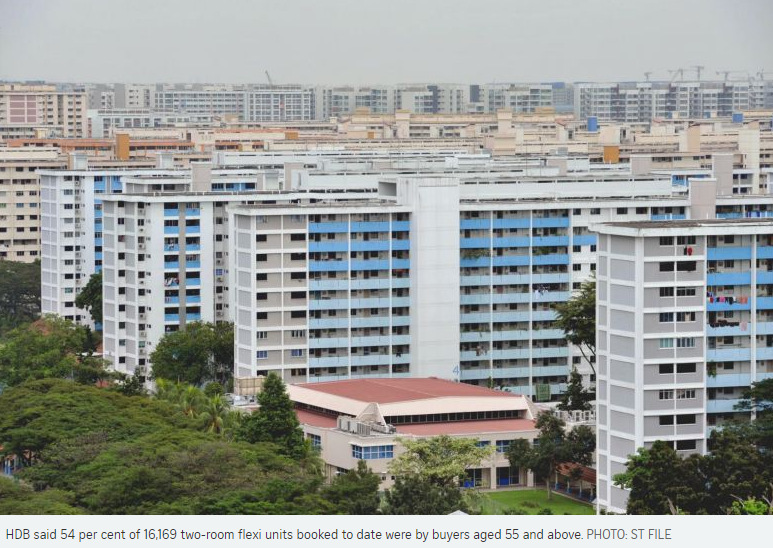 Of the 16,169 two-room flexi units booked to date, more than half of the buyers - 54 per cent - are aged 55 and above, said the Housing Board, giving an update last Friday. Of these, the vast majority - 91 per cent - went for the shorter leases. They can also opt for senior-friendly features like grab bars in the flats, which are typically 36 sq m or 45 sq m in size. Among these buyers were a semi-retired couple who opted for a new two-room flat with a 45-year lease after learning of the scheme. Mr Tan Hiok San, 68, and his wife, Madam Chen Yuxian, 58, downsized from their three-room flat in Chai Chee as it made more sense financially. They had initially wanted to buy a larger flat with a 99-year lease using money they got from selling their coffee shop business. They paid $120,000 for their 45-year-lease two-room flat. A comparable flat with a 99-year lease costs around $230,000 to $250,000. Their new flat is in the same neighbourhood, and they moved in last April after selling their resale corner flat for $370,000. "We don't really have much use for a 99-year lease as we have no children to pass the flat on to. Moving to a smaller flat was not a problem for us and we are still in Chai Chee, which we are very familiar with," said Madam Chen. Among the shorter lease periods, the 40-year one was the most popular with 2,545 buyers. This was followed by the 35-year lease with 2,154 buyers and the 30-year lease with 1,344 buyers. 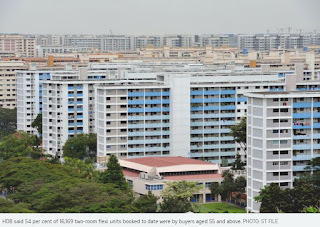 The HDB said 139 buyers opted for the shortest lease of 15 years. Six years since the foreign manpower tap was last tightened in the service sector, businesses are being told they need to do more. 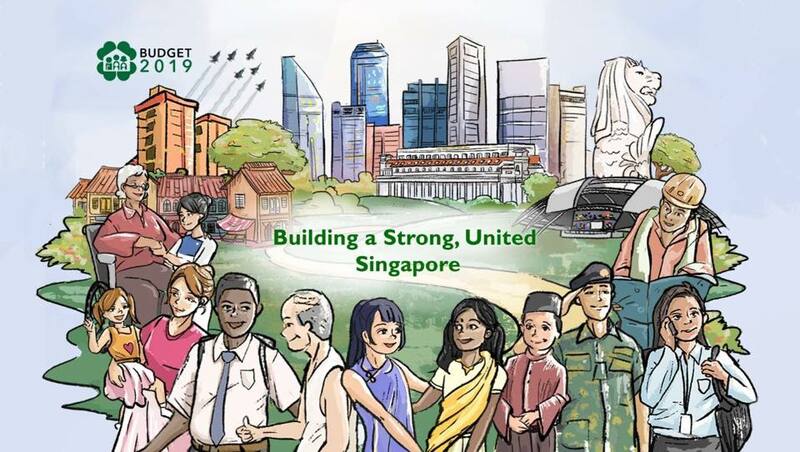 While some have heeded the call to become more productive, others have lagged behind, leading Finance Minister Heng Swee Keat to say in his Budget speech that growth in the number of foreign service staff may be on an "unsustainable path". "Our (local) workforce growth is tapering, and if we do not use this narrow window to double down on restructuring, our companies will find it even harder in the future," he said last Monday. Thus the service sector Dependency Ratio Ceiling (DRC) - the proportion of foreigners on work permits or S Passes a firm can employ - is being cut from 40 per cent to 38 per cent and then 35 per cent over two years. The sub-quota for S Pass workers - mid-skilled foreigners paid at least $2,300 a month - will also drop from 15 per cent to 13 per cent and then to 10 per cent. What does this mean for companies? Now, if a firm needs 20 staff to operate, it can hire 12 locals and eight foreign workers. Come Jan 1, 2021, if it needs 20 staff to operate, it will need to hire another local worker to replace one foreigner. Or if it manages to operate more efficiently, it can retain the 12 local staff and employ only six foreign workers. What is holding the sector back? Insight looks at the challenges businesses are facing and how the quota cuts are likely to play out. The service sector has been employing more and more workers over the years, even as manufacturing and construction cut back. In particular, growth in the number of S Pass and work permit holders in services has been picking up pace. It rose by about 3 per cent a year, or 34,000, in the past three years, Mr Heng said. A spokesman for the Ministry of Manpower (MOM) said the increase was broad-based across services, but the segments that will be hit hardest by the quota cuts will be accommodation, food services, real estate services, transportation and storage, and arts, entertainment and recreation. Mr Heng also noted that the increase in the number of S Pass holders in services last year was the highest in five years. These are workers who have at least a diploma or a degree qualification, and many work in frontline service jobs like customer service, food and beverage (F&B) management and nursing, recruiters tell Insight. Children lining a Chinese opera stage watching dramatic wayang performers; a woman selling dim sum from a roadside stall, boats ferrying charcoal and bakau wood used in construction. These are just a few of the many images of Singapore in the 1970s to 1990s captured by French photography enthusiast Paul Piollet, 84, when he was based here and in Indonesia. Even after he retired in 1986, after a career in the oil industry, he returned to Singapore about twice a year to take snapshots of the island's street life. Earlier this month, Mr Piollet, who now lives in Clermont-Ferrand, France, donated 441 colour slides to the National Heritage Board (NHB). He had previously donated a smaller number of images to the National Library and National Archives of Singapore. Mr Piollet, who is in Singapore to donate the collection, said: "I didn't want these photos to be forgotten. The wisest thing to do is to leave them in the hands of Singaporeans than forgotten in a cupboard in France." 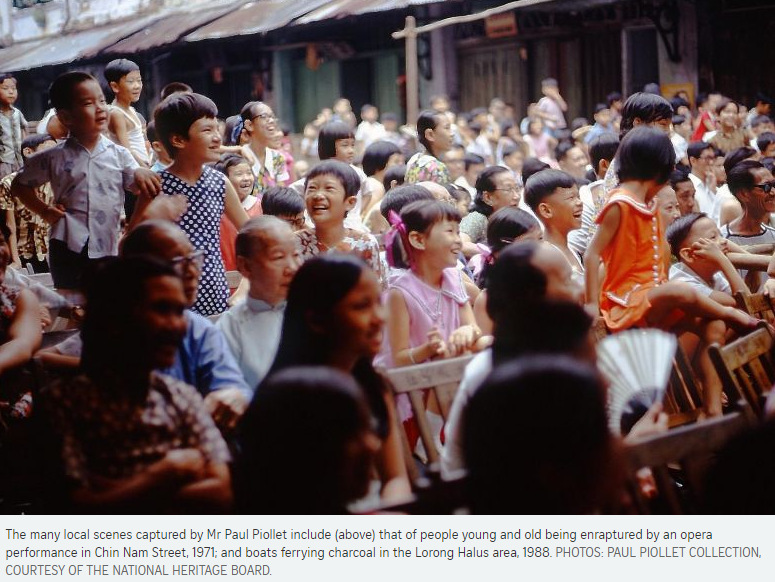 NHB's assistant chief executive of policy and community, Mr Alvin Tan, said Mr Piollet's snapshots of Singapore are quite rare. He added: "This donation is important because it provides us with a visual record of Singapore during a period when photo-documentation was rare and few had the means to capture such scenes." Mr Piollet, who would often walk the streets of Singapore and take photos on his Pentax camera, using Kodachrome 35mm film, said he was drawn by the island's tropical weather, its architecture, culture, music and scents. "I very much enjoyed the culture and colour of old Singapore," he said. During his free time, he would hop on buses and travel to the outskirts of the island, to areas such as Choa Chu Kang and Woodlands, which he described as Singapore's countryside. There, he would explore clusters of kampung and capture the area's activities. His snapshots also document Bugis boats from the Riau settlements, old Chinese kampung temples, provision shops, children at play, as well as old trades including a shop in Victoria Street which made and sold wooden barrels, and another in Chinatown specialising in carvings of religious figurines. 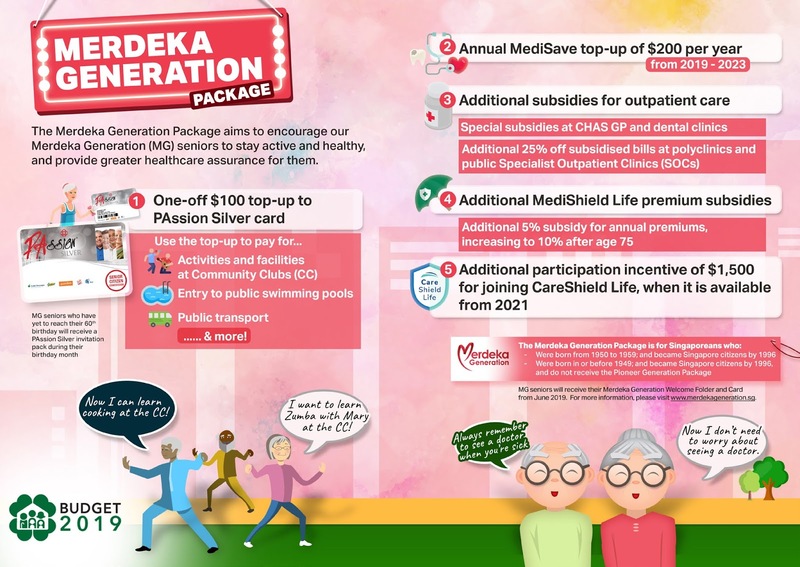 Healthcare subsidies, money for healthy activities and public transport – these are some of the benefits eligible older Singaporeans can look forward to as part of the Merdeka Generation Package. 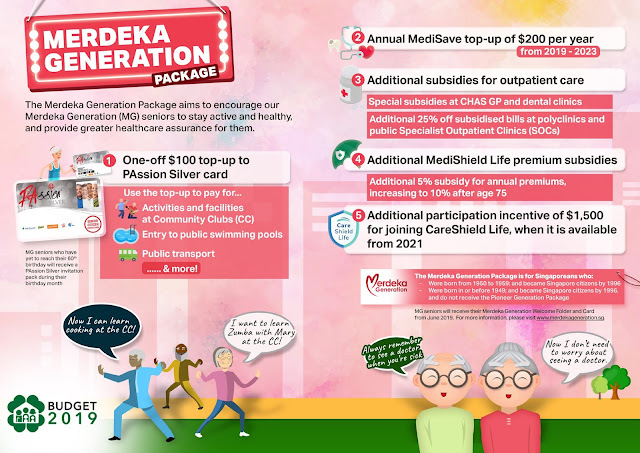 First announced during Prime Minister Lee Hsien Loong’s National Day Rally last year, the package is meant to express appreciation for the Merdeka Generation and help them with healthcare costs as well as to keep active and healthy. Finance Minister Heng Swee Keat on Monday (Feb 18) shared more details about this in his Budget 2019 speech. All beneficiaries must have obtained their citizenship by 1996. The package is estimated to cost more than S$8 billion – in current dollars - over recipients’ lifetimes. A total of S$6.1 billion will be set aside for a new Merdeka Generation Fund. With interest accumulated over time, this will cover the full projected costs of the package, said the Finance Minister in his speech. All eligible seniors will be notified by April 2019, and will receive their Merdeka Generation cards from June this year. A more detailed timeline and further information will be provided at the Committee of Supply Budget debate. Seniors will get a one-time S$100 top-up to their PAssion Silver cards. This can be used to pay for activities and facilities at community clubs, entry to public swimming pools and public transport, among other things. Starting this year, Merdeka Generation seniors will get a MediSave top-up of S$200 every year for five years until 2023, to help them save more for healthcare needs. Special Community Health Assist Scheme (CHAS) subsidies will be available for package recipients, geared towards common illnesses, chronic conditions and dental procedures. All Merdeka Generation seniors will receive these regardless of income, including those without a CHAS card at the moment. They will also get an additional 25 per cent off subsidised bills at polyclinics and public specialist outpatient clinics. These subsidies will start from 5 per cent of MediShield Life premiums and increase to 10 per cent after seniors hit the age of 75. This translates to a discount of between S$31.50 and S$918, depending on the premium amount. Seniors who join CareShield Life will get an extra S$1,500 (when the scheme becomes available for existing cohorts in 2021). This is on top of a previously announced S$2,500 sum, meaning that all Merdeka Generation seniors who join the scheme will end up getting S$4,000 of participation incentives. Finance Minister Heng Swee Keat yesterday delivered a generous but targeted Budget aimed at helping Singaporeans with healthcare costs and other expenses, and giving businesses and workers support to thrive in a changing global environment. He unveiled a $6.1 billion fund that will subsidise healthcare for Singaporeans born in the 1950s, with extra subsidies for outpatient care and MediShield Life premiums, as well as Medisave top-ups for five years. Called the Merdeka Generation Package, this will benefit nearly 500,000 Singaporeans in all, and is the second initiative of its kind after the $8 billion Pioneer Generation Package announced in 2014. With Singapore commemorating its bicentenary this year, Mr Heng announced two initiatives to mark what he called a key turning point in Singapore's development - a $200 million community fund to match charity donations, and a $1.1 billion Bicentennial Bonus. This special bonus includes GST vouchers of up to $300 in cash that will benefit 1.4 million Singaporeans, and a personal income tax rebate of 50 per cent, capped at $200. These measures are part of Singapore's efforts to forge a caring and inclusive society, said Mr Heng, who presented his first Budget since being named as the designated successor to Prime Minister Lee Hsien Loong late last year. Noting that support for globalisation was on the wane worldwide, Mr Heng also flagged longer-term domestic challenges such as ageing, social mobility, economic transformation and climate change. Singapore should build on its strengths, he said, pointing to the country's multicultural society and openness to diversity. Mr Heng also devoted part of his two-hour speech to the importance of keeping Singapore safe and secure. "We cannot take our peace, prosperity and stability for granted," he said. That is why the Government will continue to invest a significant share of its resources - about 30 per cent of total expenditure this year - to support defence, security and diplomacy efforts, he added. "This spending is significant, but indispensable," he said, adding that even more would be spent if needed to safeguard Singapore. Turning to the economy, Mr Heng said efforts to transform it are bearing fruit, with economic growth of 3.2 per cent last year. All 23 Industry Transformation Maps, which cover about 80 per cent of the economy, have been launched, he said, noting that productivity has grown by 3.6 per cent a year for the past three years. But with global growth expected to moderate this year in an increasingly uncertain climate, he outlined measures to help companies and workers build deep capabilities so that they can stay relevant amid a wave of disruption. The Government will spend $4.6 billion on this front over the next three years - $3.6 billion to help workers and $1 billion to strengthen companies. Among the initiatives are a $100 million fund to help small and medium-sized firms (SMEs) scale up, as well as more aid for them to go digital, and new programmes to help workers pick up skills in areas like prefabrication. But Mr Heng also flagged uneven productivity growth across sectors, with the service sector seeing a 3 per cent growth in S Pass and work permit holders per year, or 34,000 in the last three years. Calling this trend unsustainable, he said: "Our workforce growth is tapering, and if we do not use this narrow window to double down on restructuring, our companies will find it even harder in the future." To that end, foreign worker quotas for the service sector will be tightened in two phases from next year, especially for S Pass holders. Mr Heng also outlined several targeted steps to help Singaporeans who are less well off. The monthly income ceiling for the Workfare Income Supplement will be raised from $2,000 to $2,300 by next January. The maximum payout each year will also be increased by up to $400. These improvements will cost an additional $206 million a year, and benefit nearly 440,000 Singaporeans in total, said Mr Heng. With healthcare needs growing, he said a scheme that subsidises primary care and basic dental care for lower-to middle-income families will be improved and extended to cover all Singaporeans for chronic conditions. A $5.1 billion fund has also been set up to fund long-term care support measures such as ElderFund and CareShield Life subsidies. Despite these spending initiatives, Mr Heng also stressed the need to maintain fiscal discipline. Recurrent revenues must meet recurrent spending in areas such as healthcare and defence, he said. "Many countries have taken the easier route by funding these recurrent expenditures through borrowing. We must not do this, as such borrowing shifts the burden of paying for today's needs onto future generations. That is not the Singapore way," he said. The tax system must hence be continually reviewed, he said, announcing that returning travellers will have a smaller allowance on tax-exempt overseas shopping and duty-free alcohol. Overall, the Budget remains expansionary, with ministries expected to spend $80.3 billion - 1.6 per cent higher than the year before. An overall deficit of $3.5 billion is projected, which Mr Heng said will be funded by previous surpluses. Singapore Business Federation chairman Teo Siong Seng said the Budget is a "well-balanced and progressive" one that encourages companies to continue to transform and prepare for the future. Parliament will sit from next Tuesday to March 8, and MPs will debate the Budget as well as spending plans of the various ministries. Singapore's acquisition of new submarines which offer more firepower and combat options is a timely move as maritime security challenges evolve and countries beef up their submarine fleets, said Defence Minister Ng Eng Hen. 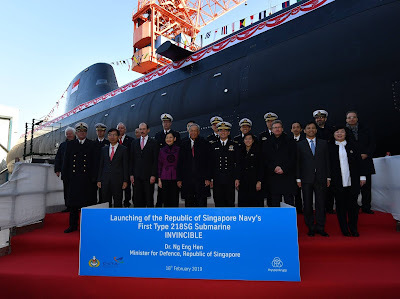 Speaking yesterday at the launch of the first Type 218SG submarine named Invincible, Dr Ng said Singapore faces threats in the maritime domain, including terrorism, the shipping of illegal arms, weapons of mass destruction and people, as well as piracy. He noted that in Asia, defence spending has risen significantly, hitting US$447 billion (S$606 billion) in 2017, a jump of about 61 per cent from 2008, with many countries modernising their armed forces. Citing countries such as China, Indonesia, Thailand, India and South Korea that are planning to expand their submarine fleets, Dr Ng added: "In this context, the acquisition of the new Type 218SG submarines is timely." Speaking to reporters later, Dr Ng also pointed out that Singapore sits astride two of the busiest sea lines of communication in the world - the South China Sea and the Strait of Malacca - through which about one-third of the world's maritime trade is transported. Referring to the Republic of Singapore Navy (RSN), he said: "So I think most people will receive this development by the RSN with assurance that it is able to do its part in keeping our sea lines of communication open not only for Singapore but the world." The new submarine will have 50 per cent longer endurance, more firepower, more capable sensors and advanced automation compared to the current RSN fleet of submarines. It will undergo sea trials in Germany before it is delivered to Singapore in 2021. 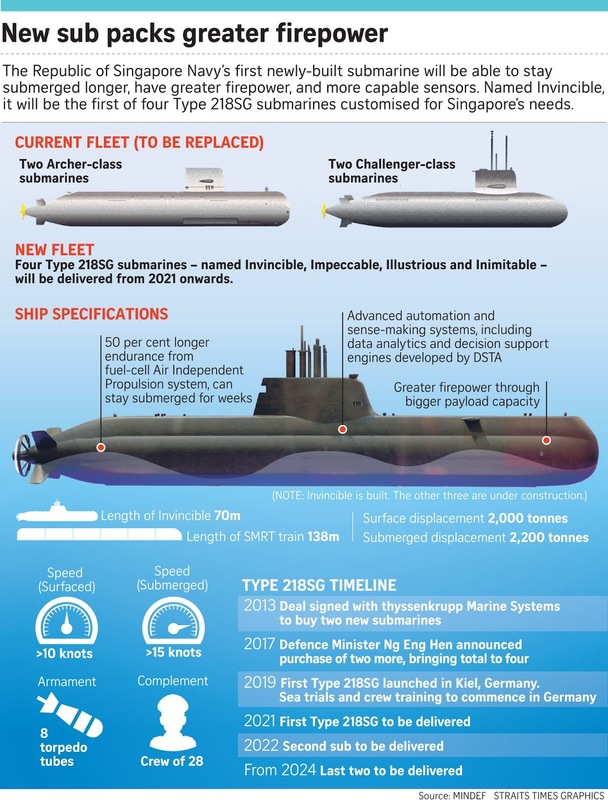 It is the first of four Type 218SG submarines slated to replace the four refurbished Challenger-and Archer-class submarines that the RSN has operated for more than two decades. The new submarines are customised for Singapore's operating environment, particularly the shallow and busy waters in the region, and are sold to no other country. The launch of the diesel-electric submarine meant that it has been built but is not yet operational. The RSN, the Defence Science and Technology Agency (DSTA) and German defence contractor thyssenkrupp Marine Systems (TKMS) worked together on the design and building of the submarine. Dr Ng called the launch - held at TKMS' shipyard in port city Kiel, about 90km from Hamburg in northern Germany - a "significant milestone" for the RSN and Singapore and hailed the new submarines as a testament to RSN's continual growth and progress. "We got here not in a single jump, but because we persisted," he said. Dr Ng's wife, Professor Ivy Ng, group chief executive of SingHealth, yesterday launched the submarine at a ceremony attended by the Chief of German Navy, Vice-Admiral Andreas Krause; RSN's Chief of Navy, Rear-Admiral Lew Chuen Hong, and senior defence officials from both countries. Dr Ng also announced the names of the other new submarines - Impeccable, Illustrious and Inimitable - which are under construction and will be delivered from 2022. The first of a new generation of neighbourhood malls, developed by the Housing Board with the feedback of residents, has opened in Punggol. Oasis Terraces, a seven-storey mall next to Oasis LRT station, has more open spaces for people to gather and a tenant mix meant to address the needs of those living in the neighbourhood. Based on feedback gathered in 2014 during early planning stages, the waterfront development includes family-friendly eateries, playgrounds, a 24-hour fitness centre and a supermarket that stays open until 11pm. More of such projects are in the pipeline. Minister for National Development Lawrence Wong, who opened Oasis Terraces yesterday, said there will be five more coming up in the next three years. Citing his experience growing up in Marine Terrace, he said HDB centres foster a special sense of emotional connection as people frequent the same shops and children play with neighbours in the community spaces. "It's what planners call a third place, a place outside of home and work where people get together, socialise, and you can build that sense of community. That's why HDB neighbourhood centres are special, and that's why we are committed to building them," he said at the new mall's community plaza. Oasis Terraces marks the comeback of HDB in building and developing these retail spaces in the heartland, called neighbourhood centres. In 2000, it allowed private developers to take the lead to tap their expertise in developing suburban commercial malls. But in 2015, HDB decided to take over again, as the private developers were not keen to build in new towns until a critical mass of residents moved in. This meant those who moved in earlier did not have sufficient amenities. Mr Wong said that as master planner, HDB can ensure new centres are well integrated with transportation nodes and the overall plans for the towns. And unlike a private developer, HDB is not out to maximise commercial returns, so the centres are designed with more community spaces for residents to mingle in. Oasis Terraces, for instance, has community gardens and a fitness corner on the rooftop, besides its 106 shops. Shops are allocated to tenants through a tender process, and decisions are based not just on price but also on qualitative factors such as the business concept and operating model, said Mr Wong. This allows HDB to better manage the tenant mix to address residents' needs so centres are not dominated by a certain type of shop or service, he said. Of the five more new-generation neighbourhood malls being built, Buangkok Square in Hougang will start operating this year. Canberra Plaza in Sembawang will see works completed this year, Hougang Rivercourt in Hougang and Northshore Plaza in Punggol will be completed next year, and Anchorvale Village in Sengkang by 2022. Public responses to incidents are a valuable source of feedback. While negative feedback may cause discomfort, it is important for policymakers to learn to process and respond better to such views. It is a common practice these days for people to assess or react to a product they buy, a service they receive, or performance or activity they took part in. Giving feedback has become very much a way of life. Feedback is not restricted to customer service or performance appraisal situations. It can also refer to public reactions to an incident, expressed as evaluations, emotions and concerns. People may have views on an incident, and also how they perceive the incident was handled or is being handled. Some recent cases come to mind - such as national servicemen training deaths, the SingHealth cyber attack and the HIV Registry data leak. Public expressions on these matters are valuable feedback that reflects and reveals much. They are unsolicited real-life reactions to actual specific incidents and how they are handled. We hear the reactions in informal conversations. We read the public comments written in mainstream media and posted on social media, with a mix of reflective and visceral reactions. A noteworthy commentary is a recent editorial in the local Chinese daily Lianhe Zaobao that raised serious questions of leadership complacency, accountability and public trust in Government. The commentary, together with others, elicited a response from Finance Minister Heng Swee Keat last Saturday, published in both Lianhe Zaobao and The Straits Times. Mr Heng stated that the Singapore Government has not "gone slack", such as becoming complacent and failing to hold senior people accountable when things went wrong. He reiterated that its leaders "will not flinch from taking a hard look at ourselves each time there is a failure, and doing whatever is necessary to put things right". Earlier this week in Parliament, Defence Minister Ng Eng Hen and Health Minister Gan Kim Yong responded to questions on the recent soldier training deaths and the HIV data leak, respectively. The ministers provided some additional details to what were already made known to the public since the news broke. The critical information on how the training deaths of the two national servicemen (Liu Kai last November and Aloysius Pang in January) occurred, and why, are currently not known. Hopefully, the two committees of inquiry will provide thorough and clear answers, and soon. For the HIV data leak, we can expect differences in views among the public on the Health Ministry's "judgment call" in decisions and actions on when and what to tell who, with regard to the data leak. The ministry's statements also spark debate on the security of personal data the public entrusted to the Government. It also raises the issue of HIV and the stigma around it, which influenced decisions on whether to inform the individuals affected and the general public of a data leak. Some will continue to have questions on how the event unfolded, the coordination among government agencies involved and their interactions and investigations with the two individuals in the centre of the data leak - American Mikhy Farrera Brochez and Singaporean Ler Teck Siang. The HIV data leak incident is still evolving, with fresh information to emerge, and possible further public exposure of the leaked data. Also, not all of the affected individuals have been informed that their personal data was leaked. Public reactions to the soldier deaths and data leak incident will continue. And they may become more negative or positive. The Government and its related agencies will have to decide how to respond to the evolving reactions to these recent adverse incidents, and future ones. Will the impending government-public interactions make things better or worse? It is useful to take a hard look at the feedback process applicable to previous and future exchanges. 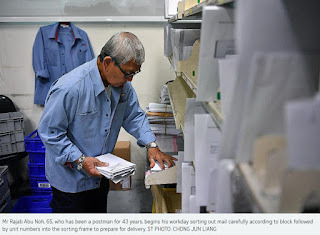 It remains a tough - if not even tougher - slog, given the drastically changed nature of mail delivery, as Singaporeans fall in love with the convenience of online shopping. SingPost, the national postal service provider, seems hard-put to keep pace with the developments. On Feb 7, it was fined $100,000 for failing to meet standards on the delivery of basic letters and registered mail here over six months in 2017. It comes after a string of delivery lapses, such as a postman being arrested for mail found discarded. SingPost has since vowed to lighten its postmen's workload and review their pay, among other measures, to improve service quality. To better understand how such service lapses could have occurred and the gruelling pace that postmen undergo, The Sunday Times followed Mr Rajab around as he goes about a usual workday. It is 6.30am on a Wednesday, and he is at the sorting area at Serangoon North Regional Delivery Base, one of seven across the island. He scarfs down his breakfast - two slices of bread with butter and kaya and a cup of coffee. That would have to fuel him through the next 12 hours of work as he opts not to stop for lunch. Save for a 10-minute trip to the toilet at 3pm, he takes no breaks. Mr Rajab's daily route takes him through 38 condo blocks of about 1,750 residential units in the Yio Chu Kang/Sengkang area. At 7.30am, he begins to carefully sort the mail according to the floors in their respective blocks. Any error means he will later have to double back to the correct block or level during delivery. At 9am, the postmen gather for a briefing. The inspector of post reminds them of complaints about missed deliveries or articles damaged when the bulky items were squeezed into letter boxes. He tells them to report back if letter boxes are full so that residents can be reminded - by slipping notices under their door - to clear them. He also reprimands the postmen for leaving the master lock for letter boxes unlocked in four instances in one neighbourhood. The meeting ends. Mr Rajab looks at the mountain of mail - a mix of letters and packages - piled high in a trolley and quickens his pace. There is no way he can put it all into the storage box on his three-wheeler scooter without its heavy weight affecting his balance. So he takes half of it and will collect the rest later at a SingPost storeroom at an HDB block along his route. He departs the base at 11am. Students armed with an A-level certificate who want to further their studies at the polytechnic can apply for course exemptions, potentially shaving six months off three-year diploma programmes. In announcing this yesterday, the Ministry of Education (MOE) said A-level students can apply for a place in August. If they secure a place and the exemption, they can start their diploma studies in the second semester in October. 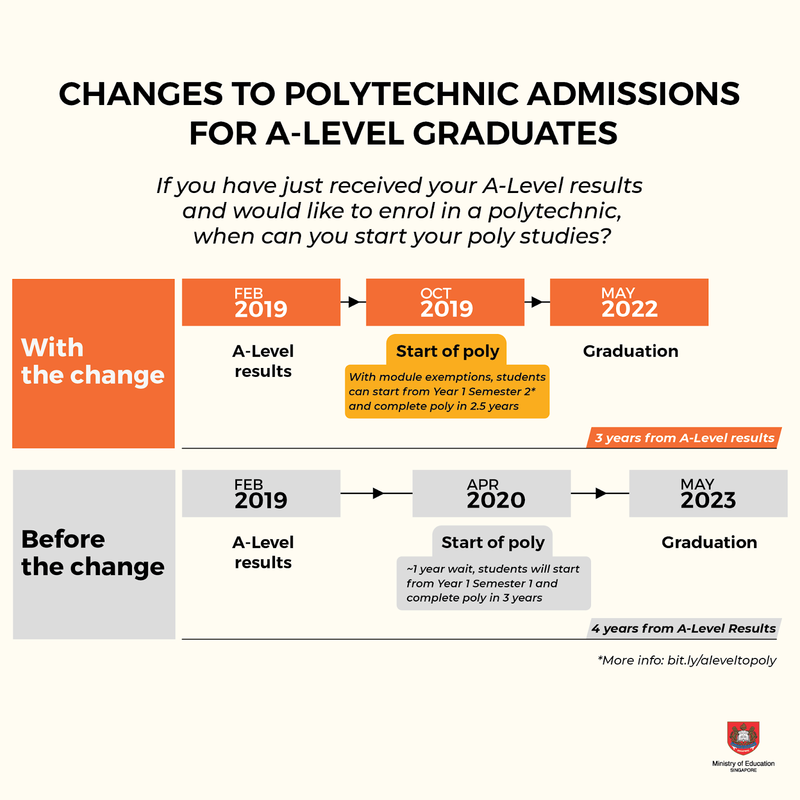 Currently, most A-level graduates apply for and enrol in a polytechnic only one year after getting their A-level results in late February or early March. This is because most polytechnic admission exercises would have closed by the time students receive their A-level results. This year's results will be released next Friday (22 Feb). A-level graduates who are eligible for the one-semester exemption, and who are not enlisting in national service, will be able to enter the polytechnics in the same year that they receive their A-level results. MOE said that about 200 A-level graduates take up diploma studies every year. These students are usually keen to pursue an applied pathway at the polytechnics that matches their area of interest. Giving further details on the course exemptions, MOE said they will be available for 110 out of the 230 courses at the five polytechnics. While these requirements may differ for specific courses, they would have generally been covered in the A-level syllabus. For example, A-level graduates taking up Ngee Ann Polytechnic's diploma in information technology may be exempted from the modules on computing mathematics and programming 1, if they have obtained passes in H2 computing or computing science and H2 mathematics. The ministry assured school leavers that places for A-level graduates will be separately catered for, and there will be no impact on places available for O-level graduates or Institute of Technical Education graduates. The Republic will introduce digital defence as the sixth pillar in its national defence framework Total Defence, signalling the threat cyber attacks and disinformation pose, and the importance of cyber security. It is the first time a new pillar has been added to the framework since it was launched 35 years ago. 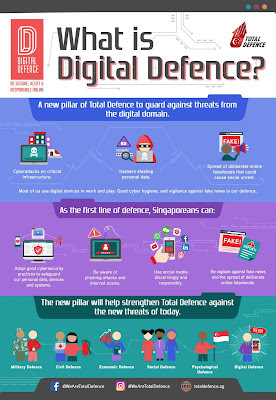 In his annual Total Defence Day message yesterday, Defence Minister Ng Eng Hen stressed that cyber-security threats and disinformation are a serious danger to Singapore, and emphasised the need to be vigilant against them. "Security threats can be real and physical like terrorism or, just as damaging, can come through the cyberworld." "Malicious malware can cripple our systems. Fake news can cause racial riots and divide our people," added Dr Ng in his message, which was uploaded on Facebook. 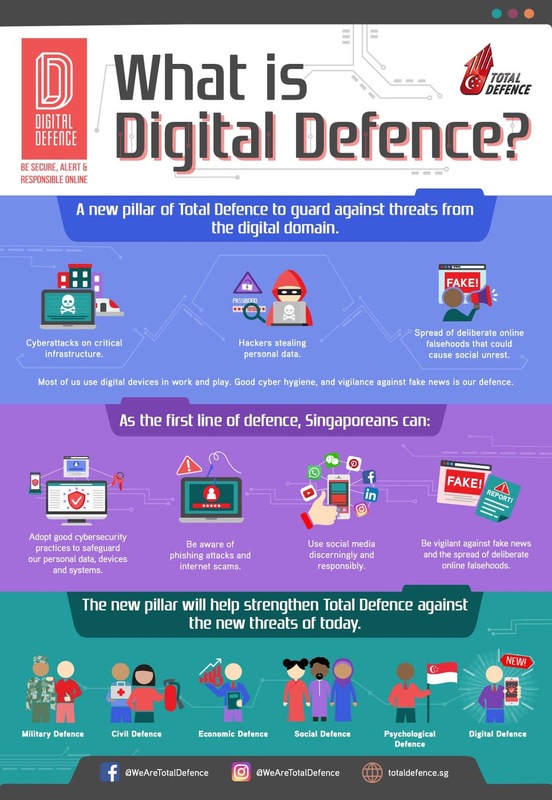 The digital defence pillar will be officially launched today by Communications and Information Minister S. Iswaran, who is also the Minister-in-charge of Cyber Security. It joins the other five pillars of Total Defence: military, civil, economic, social and psychological defence. In his speech, Dr Ng reiterated that the purpose of Total Defence Day, which falls on Feb 15, is to remember the Japanese Occupation. On Feb 15, 1942, the British surrendered Singapore to the Japanese, who occupied the country until Sept 12, 1945. "Our parents and grandparents suffered in the 3½ years of deprivation and humiliation that followed. "We remember those events of the Japanese Occupation to teach every new generation of Singaporeans about the price of failure to defend this country," he said. Total Defence was launched in 1984 as a national defence initiative to rally all citizens behind the Singapore Armed Forces during wartime. It was also envisaged to build a sense of determination for Singaporeans to defend the country under all circumstances. The framework has since undergone reviews and changes, but this is the first time a pillar outside of the original five conceptualised is being added. Total Defence is now contextualised to address new threats, and applied to address non-military challenges too, such as economic recessions, pandemics and natural disasters. Trade and Industry Minister Chan Chun Sing also commemorated Total Defence Day yesterday at an inaugural Maritime Nation Forum held at the Singapore Maritime Gallery. After leading a pledge recitation, he held a dialogue with about 100 forum participants on the challenges that Singapore faces as a maritime nation. He noted that it was the first time professionals from the maritime industry, Republic of Singapore Navy servicemen and tertiary students were coming together to mark Total Defence Day. Emphasising the importance of the national defence framework, he said: "When there are external pressures on our country to give in to external demands, Singaporeans must continue to be psychologically resilient and stay together to keep Singapore strong."